On Wednesday, January 23rd, 2019 students taking Culinary II received special visitors to their classroom. 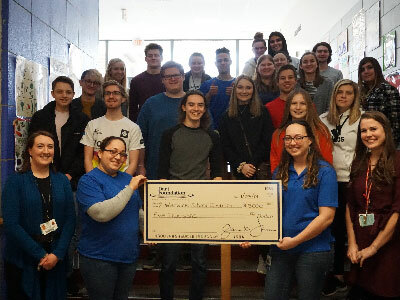 Members from the Dart Foundation stopped by the Warwick High School to deliver a check in the amount of $5,000 to be split among the Family and Consumer Science department. FACS teachers, Mrs. Emily Badaracco and Ms. Kim Sweigart explained the grant money would be used to purchase equipment that’s been much needed for the high school classes. “These aren’t just your average sewing machines that we are purchasing, these are high-tech embroidery machines,” stated Ms. Kim Sweigart. “I’m very excited to see what these students will be able to do with these machines, it’s more than just putting a pattern together, these will allow students to have more creativity, from creating their design on the computer and actually having it embroidered on.” She continued on by saying that these new sewing machines will greatly help the students wanting to pursue a career in fashion, especially the ones in her Contemporary Fashion class. This is the first grant that the FACS department applied for and they are so anxious to get the equipment up and running in their classrooms.